The Mousetrap tickets at Playhouse Theatre, Edinburgh. 2019. 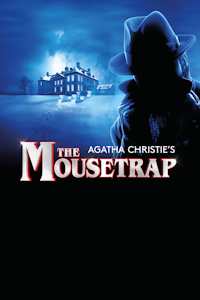 Find the best The Mousetrap play tickets at Playhouse Theatre, Edinburgh. Opened at the Ambassadors Theatre in London on 25 November 1952. The World's Longest Running Play! A group of people gathered together in a remote part of the countryside discover there is a murderer in their midst. The question is which one of them is the guilty party. Approximate runtime 140minutes (including any interval). Performers Gwyneth Strong (Mrs Boyle until Jul 13), Susan Penhaligon (Mrs Boyle from Jul 15-Nov 16 2019), David Alcock (Mr Paravacini), Geoff Arnold (Detetive Sgt Trotter), Nick Biadon (Giles Ralston), Lewis Chandler (Christopher Wrien), John Griffiths (Major Metcalf), Harriett Hare (Mollie Ralston), Saskia Vaigncourt-Strallen (Miss Caswell). Author Agatha Christie. Producer Adam Spiegel. Producer Stephen Waley-Cohen. Monday, 27th May 2019 to Wednesday, 29th May 2019. The Mousetrap tickets: The tabs above allow you to select between links to suppliers and date searching. Click on a supplier's logo to see their details and on the 'buy now' button to see and check the tickets on offer.